Rent our "Gear Packs" and save. Hit the trail on the Triple Crown! 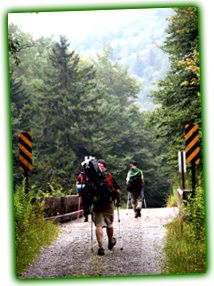 Located in Virginia, it is one of the most popular and scenic stretches of the Appalachian Trail. Absorb the beauty of God's creation as your journey takes you to panoramic vistas. Leave the traveled path and trek on the rugged North Mountain Trail! Our experienced staff will guide you on this 5 day adventure on the Appalachian Trail, Andy Layne Trail, and several other rugged spur trails, covering approximately 40 miles. Our "off campus" trips are based on the scriptural principle found in Proverbs 27:17, "Iron Sharpeneth Iron...". The goal is to allow men to focus on the Creator while strengthening each other's walk with Christ. This discipleship trip can be a pivotal and monumental place in lives of those who attend. Get info our our NEW "Gear Packs"
Step back from your schedule and refocus your attention on the Creator. Backpacks, water-bottles, mess kits, permits, and dinner meals on the trail are provided. This can be a life changing adventure as you push yourself to new levels. This trip is for adult males and teen young men age 16 or older. The trip is ranked as "moderate to dificult". It is rugged enough for the experienced hiker to enjoy, yet will push the "once a year" hiker. As the days quickly pass we are running out of preparation days. 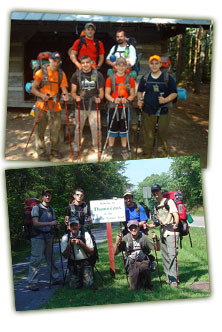 This letter is for all the men involved in our ï¿½Tripple Crown - Appalachian Trailï¿½ discipleship journey. The information on this page is to help you prepare and to make sure that we are all on the same page. As you know this can and will be a fun and exciting trip as we will be hiking approximately 40 miles. The main purpose of this journey is a spiritual one. The idea and scriptural principal we find in Proverbs 27:17 is what this trip is based upon (Iron Sharpeneth Iron). Please be in prayer about this and remember that the devil will try and hinder any opportunity in which we may try and draw closer to the Lord. This is also an opportunity to help another brother grow in his walk with God. This section of the trail that we will hike is beautiful and very enjoyable to hike. I will be the Lead Guide during the week and Adam Hager will be the Assistant Guide. We are looking forward to an exciting week. The cost of the trip is will be $139.00 per person. You can write a check to The Wilderness Christian Camp or simply pay online with a credit card. All hikers must register. The cost includes all your evening meals, backpack, water bottles, tent, mess kit, maps, and trail permits. Please let me know if you have questions or details that need to be cleared up. I am eagerly anticipating an amazing week together. I am praying that God will do a great work among us during these five days. Please pray along with me.